I'm so excited to share today's post! 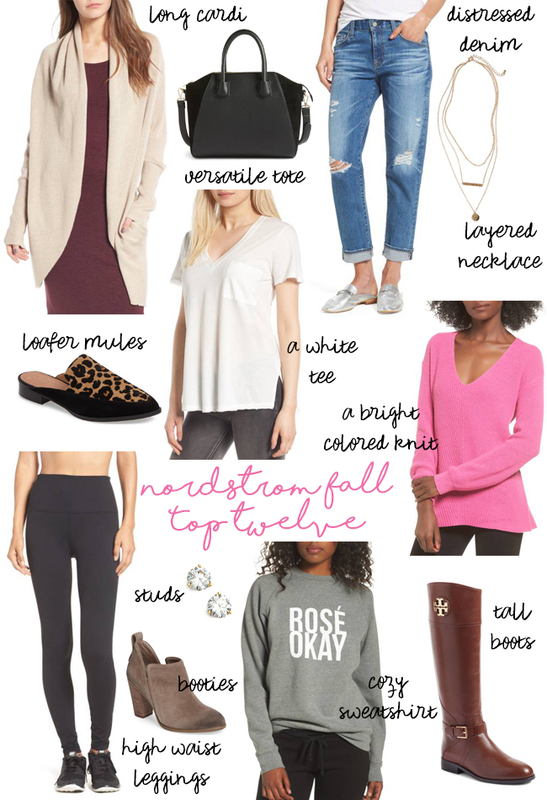 I had a follower asked earlier this week for my top ten items from Nordstrom for fall and I thought it would make a fabulous post. Clearly, I couldn't pick only ten lol. Since the Nordstrom Anniversary Sale I've been obsessing over several cool weather items, some of which are pictured in the photo above. I'm already impressed with Nordstrom's selection of sweaters, booties, and denim for the upcoming season and can't wait to share my favorites with you today. Long Cardi. A lightweight long cardigan is a must for fall. They are so versatile! You can wear them with a simple tee (like the one pictured above), a nice blouse and pants to work, a dress, or even a top and skirt combo. There are some beautiful colors and textures this season like the one pictured as my fav. It's so soft and comfy! Versatile Tote. The tote I've included is hands down my favorite bag right now. I've been carrying it non-stop no matter the occasion. It's so easy to get in and out of, has protective feet on the bottom, and a fabulous animal print on the inside. Plus, it's a fantastic price for a chic, structured tote. Btw my pink pom keychain is from the stationary store Papyrus! Distressed Denim. I've been living in distressed denim during summer and plan to continue the trend into fall. They look amazing worn with a slouchy sweater and a fab bootie. I recently snagged the boyfriend jean pictured and they are so stinking comfortable! Completely worth the price! FYI... definitely size down. I actually had to get a 23 (and to find them I had to chat with Nordstrom customer service online - they are awesome!). Layered Necklace. I'm LOVING the layered necklace trend. AND there are so many at amazing price points. The one shown above is only $19! I've been wearing my three strand necklace with a choker style stone version for even more detailing. It's a look appropriate for both work and play and is perfect for dressing up a simple, monochromatic outfit. Loafer Mules. Oh, the loafer mule trend! I told myself I only needed one pair and now have three lol. Funny how that happens! The leopard pair I'm sharing has been so very popular and for good reason. They fit well and are also comfortable... and they look super chic. They would look fantastic with the distressed boyfriend jean and pink knit! A White Tee. A versatile white tee is a wardrobe staple. And as much as I wear mine, I need several. There are some great options that are really affordable in styles that come in a rainbow of colors. I love the side slits in the one above because it makes it easy to tuck in the front and to tie the front in a knot. I'm wearing mine underneath the sweatshirt in the photos. A Bright Colored Knit. Okay you guys, this pink knit is going to go fast! I just ordered mine yesterday because this color is so hard to come by and mine is going to be on repeat all season long. Hot pink and leopard print, with a layered necklace... yes, please! High-Waist Leggings. These are my FAV leggings for fall. I have three pairs because last year I literally lived in them. They are thick enough to be substantial enough to wear as pants and the fabric really holds you in where you need it. I love wearing mine with tall boots (i.e. pictured above) and a comfy sweater. Or a jean jacket and tee! Stud Earrings. So, you may be wondering why these are a fall staple but I had to list them because I wear them every. single. day. They are very reasonably priced and look as nice as the real thing! They come in varying sizes - my favorite is the one carat. Booties. These are the BEST booties ever! I cannot say enough good things about the look and the comfort. A lot of people have asked about socks and with this kind of bootie and you don't need them! One, they are so low cut socks would show. And two, they are incredibly comfortable worn alone. They look incredible paired with dresses, jeans, and even shorts - which means you can wear them now. Yay! Cozy Sweatshirt. This is my second sweatshirt I've purchased from this brand and they are the best ones I've ever owned. They are comfortable, warm, high-quality (worth the $$), wash well, and have some of the cutest sayings. I also love that they are a true crew neck! The other version I own says Coffee Now Please (adorable!). Tall Boots. These boots were my fall splurge. I originally ordered them thinking they wouldn't work but then I tried them on and it was all over. They fit like a glove (fyi I have very shallow feet and didn't have to size up... if not, size up) and are incredibly comfortable. Plus, I've talked to several girls who said they've had theirs for YEARS and they still look just as good.